A small family hotel complex of three villas, standing on a hillside with a panoramic view of the village. Each villa is independent, ensuring full privacy with its own surrounding area, its own verandas, patios and greenery, its own swimming pool and its own parking spaces. 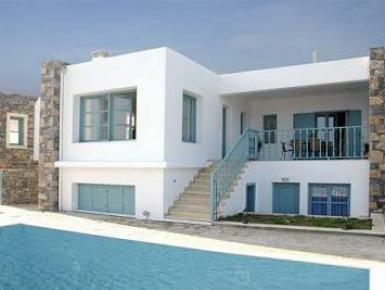 All three villas look out over the vast blue Sea of Crete, the beautiful islet of Mohlos with its Minoan ruins, the imposing "Kastelas" peak and other mountains, Mohlos and the nearby villages and the lovely farming landscape with its small plain, hills and foothills cloaked in silver-green olive trees. This is a magical, inspiring and peaceful spot.